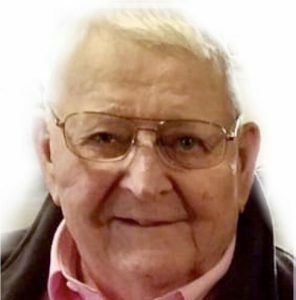 Frank Svoboda, 86 of Howells, died Tuesday, February 5, 2019 at Stanton Health Center in Stanton. Visitation Thursday, 4:00 p.m. to 7:30 p.m.
Frank E. Svoboda was born September 23, 1932 at home in Howells, to Frank J. and Esther L. (Nadrchal) Svoboda. He attended Dist. 48 school and graduated from Howells High School. On June 23, 1953 Frank was united in marriage to Valdean Sayers at St. John's Lutheran Church in Leigh. In 1953 he enlisted in the United States Army and served for two years. He received his training at Ft. Riley, Kansas and served in Japan and Korea rebuilding airport runways. He then came back to the states and finished his service at Ft. Leonard Wood, Missouri. Frank was a farmer, doing a lot of custom work including shelling corn, baling hay and also sold seed corn for many years. He also worked at Cedar Hill Cattle Company and also was a store salesman for many years at Hegemann Hardware and was a Farm Bureau dealer for many years. Frank is a life member of V.F.W. Post #4836 and a member of American Legion Post #155 of Howells. He was a member of Trinity Lutheran Church in Howells where he had served as an elder, secretary and served on the building committee. Frank is survived by is son Kenny (Jana) Svoboda of Platte Center, Roger Svoboda of Fairfield, Montana. daughters Sandra (Donnie) Seda of Columbus, Carol (Delwin) Hegemann of Howells, brothers Robert (Shirley) Svoboda of Schuyler, Dave (Lynn) Svoboda of Schuyler. sister Joanie Smejkal of Bellevue. brothers-in-law Milo Brichacek of Schuyler, Elmer Dostal of Dodge. Sisters-in-law Pat Svoboda of Dodge, Delores Toman of Clarkson. 12 grandchildren: Jessica (Dustin) Hake of Platte Center, Jordan Svoboda of Creston, Kris (Spencer) Schmitz of Helena, Montana, Jenny Svoboda of Schuyler. Ashley (Zach) Reicks of Columbus, Katie (Logan) Lukow of Hastings, Cody Seda of Columbus, Jackie (Brandon) Olson of Clarkson, Zack (Megan) Fendrick of Clarkson, Kayla (Alex) Heard of Columbus, Vanessa Hegemann of Lincoln, Jacob Hegemann of Howells. 13 great grandchildren: Carter, Lance, Eli, Bridger, Austin, Leyton, Camden, Lily, Rolland, Scarlett, Ella, Grace Davis and Sophia. He was preceded in death by his parents, wife Valdean, daughter and son-in-law Theresa (Dave) Fendrick, sisters Dorothy Brichacek and Betty Glodowski and brother Joe Svoboda.